An illuminating biography of the renowned Southern gardening writer Elizabeth Lawrence by the editor of the acclaimed book Two Gardeners. 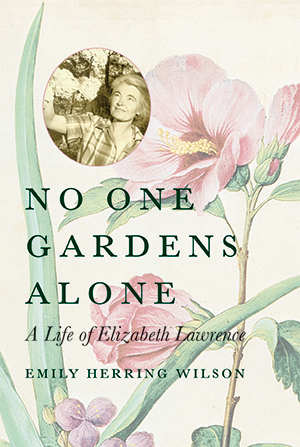 No One Gardens Alone tells for the first time the story of Elizabeth Lawrence (1904-1985). Like classic biographies of Emily Dickinson and Edna St. Vincent Millay, this fascinating book reveals Lawrence in all her complexity and establishes her, at last, as one of the premier gardeners and gardening writers of the twentieth century. Elizabeth Lawrence (1904-1985) lived a singular, often contradictory life. She was a traditional southerner; a successful, independent garden writer with her own newspaper column and numerous books to her credit; a dutiful daughter who cared for her elders and lived with her mother; a landscape architect; a passionate poet; a friend of literary figures like Eudora Welty and Joseph Mitchell; and a very private woman whose recently discovered letters illuminate aspects of her mystery. Lawrence earned many fans during her lifetime and gained even more after her death with the reissue of many of her classic books. When Emily Herring Wilson edited a collection of letters between Lawrence and famed New Yorker editor Katharine S. White in Two Gardeners, she found legions of readers who were eager to know more about the legendary Lawrence. Now, one hundred years after her birth, No One Gardens Alone tells for the first time the story of this fascinating woman. Like classic biographies of literary figures such as Emily Dickinson and Edna St. Vincent Millay, this book reveals Lawrence in all her complexity and establishes her, at last, as one of the premier gardeners and garden writers of the twentieth century. This is the biography of Elizabeth Lawrence that we have all been waiting for. Even though Lawrence's writings are legendary among Southern gardeners, her personal life has always been somewhat elusive. Wilson deftly weaves together Lawrence's passions - her gardens, family circle, cherished friendships, and even her religious beliefs-in a compelling narrative. "Lawrence’s life is celebrated with joy, reverence, and clarity in this captivating biography of the quintessential horticulturalist whose columns and books about her private Southern garden inspired gardeners throughout the country. Wilson vibrantly traces Lawrence’s developments from a shy, devoted daughter to a pioneering landscape architect and prolific garden writer." "[A] well-written and carefully researched biography of a giant in gardening literature . . . It brings to life a world that seems to have disappeared, one where women's lives were bound by family and social convention, but one in which it was still possible to live a rich life, nourished by a passion for gardening and the love of friends." "Gardeners who enjoy history and literature will be fascinated as a life unfolds . . . the reader will have the satisfaction of knowing a remarkable woman who loved her garden and fellow gardeners, a person you wished lived right next door." "Emily Herring Wilson lifts the veil on an elusive figure whose classic garden books have delighted generations." "Reading for a winter's night for those, like Lawrence, who ponder why we garden."